Try the different distribution modes for more fun. 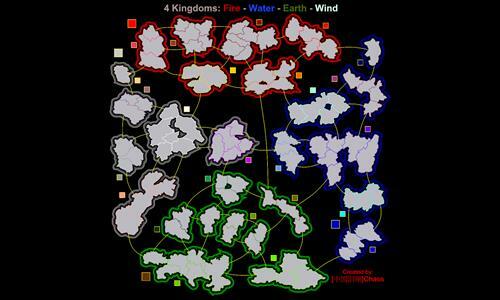 This map has been updated to improve graphics and game-play. One of my favourites for 4 Person FFA or 2v2 games. Lots of scope for different tactics to be used and for games to evolve differently to previous ones. If you haven't tried this map, I recommend that you do. Review by Qi on 3/27/2012. 4/5. Very strategic. It seems to have been made for games with four players or less. Review by [NL] Willem van Oranje on 6/13/2013. Review by Krulle on 8/28/2013. Nice. Thank you! I enjoyed it! Review by tracy on 4/2/2013. Review by Captain Carrot on 5/15/2012. A nice map. Initial distribution plays too major a role in my opinion, and once you've captured two islands you've practically won (at least in a no-teams 4 players), but it's recreating. Map has been updated, new graphics and better names for territories. Review by Olkani [PG] on 11/27/2015.